The sudden, terrifying collapse of huge buildings has caused countless tragedies throughout history, highlighting the importance of sound, safe and ethical engineering. Seemingly rock-solid structures all over the world have cracked, split, and disintegrated right beneath people’s feet. In some cases, it has taken no more than ten seconds for towering edifices to come crashing down, transformed into smoldering mounds of mangled debris and burying everyone inside. While many man-made buildings are both inspiring and beautiful, human error, a lack of proper safety standards, and unenforced building codes can lead to truly horrifying catastrophes. 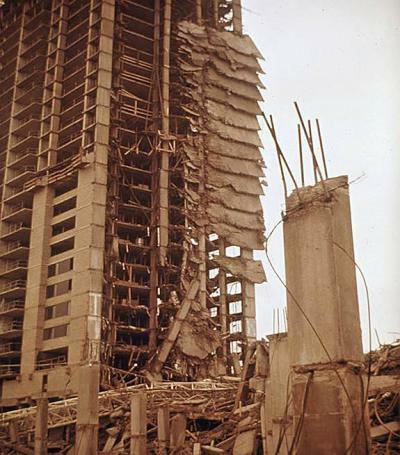 In East London, on May 16, 1968, a single match triggered the collapse of an entire corner of this massive 22-story building. Ivy Hodge, a 56-year-old cake decorator living on the 18th floor, got up early to make herself a cup of tea. However, she got a lot more than she’d bargained for. When Miss Hodge lit her stove, the spark from the match triggered a devastating gas explosion. The blast tore through the joints connecting the walls to the floor and threw her to the ground. The load-bearing walls came apart, leaving the four apartments above her without any kind of structural support. One by one, they came down, tearing through the floors below like falling dominoes until an entire corner of the building lay in ruins. 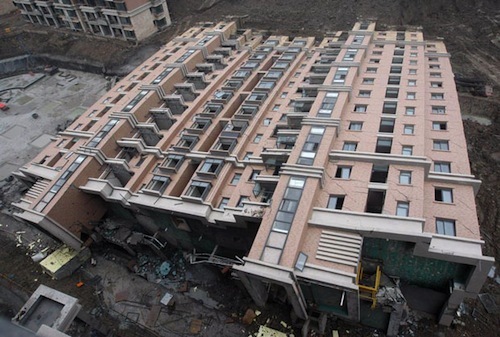 The building was in fact new, its construction completed just five days prior to the collapse. 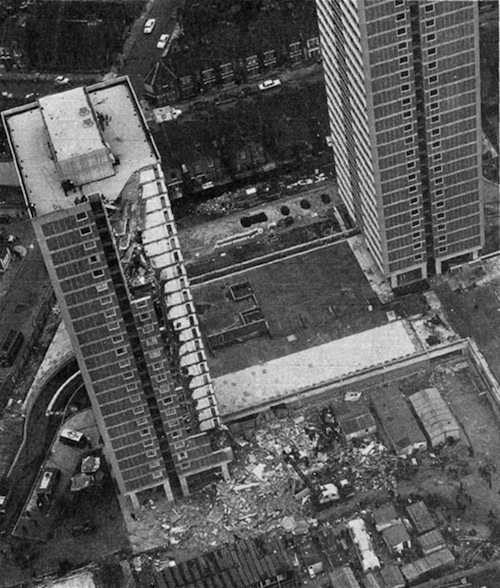 When Ronan Point came tumbling down, 260 people were in residence. Surprisingly, only four were killed in the disaster, while 17 were injured. Although the building was rebuilt and the joints strengthened, public confidence in high-rise tower buildings took a huge knock. Many high-rise blocks, including Ronan Point, were eventually pulled down to make room for less intimidating low-rise housing. Ivy Hodge was treated for burns, but ultimately she and her gas stove, which she took with her to her new address, both survived. The Highland Towers complex consisted of three 12-story residential buildings built at the base of steep hill just outside of Malaysia’s capital city, Kuala Lumpur. The retaining walls and drainage system had been poorly designed and badly maintained. The situation grew more dangerous when another development company began construction on a ridge just above Highland Towers. The land was stripped and exposed to erosion, and some of the drainage pipes were blocked with branches. Ten days of non-stop rain put an enormous amount of pressure on the pipes. At various points on the hill, the pipes burst, and the water content of the soil rose to dangerous levels. Eventually, a landslip took down a large retaining wall. One hundred thousand square meters of mud slid into Block One, carrying it forward and eventually snapping it. Three people were pulled out alive on the first day, but 12 days of frantic searching failed to unearth any more survivors. In the aftermath, 48 bodies were recovered. Block Two and Block Three were evacuated and stand empty to this day, like grim, overgrown tombstones. On November 15, 2010, monsoon rains and a swollen river proved too much for a poorly constructed tenement building in New Delhi, India. Tragically, 67 people died in the collapse and a further 150 were injured. The multi-story building housed around 400 migrant workers from rural parts of eastern India. With most earning barely enough to cover basic costs, they had turned to living in crowded, illegally built apartment blocks. 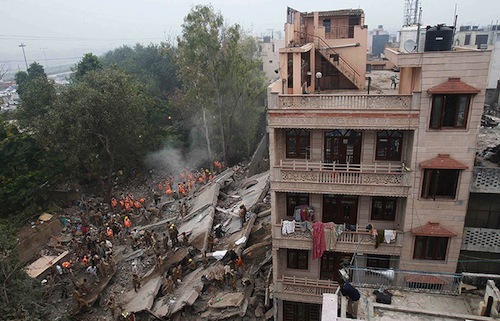 Sixty-seven tenants of this New Delhi building paid the price with their lives when the structure crashed to the ground without warning at 8:00 pm. Rescuers used sniffer dogs in an attempt to discover survivors in the wreckage and pounded through large pieces of the building with jackhammers. Bodies were pulled from the twisted remains all night long, with anxious family members standing by, waiting to hear the news: dead or alive? On March 2, 1973, tragedy struck the Skyline Plaza complex in Bailey’s Crossroads, Virginia. One of the complex’s towering apartment buildings collapsed, leaving a huge, eerie cloud of dust and debris where it once stood. Perhaps surprisingly, construction hadn’t even completed at the time of the disaster. The building was not due to open until August. Although there was no flaw in the design per se, the forms supporting the concrete columns on the 22nd floor were prematurely removed. 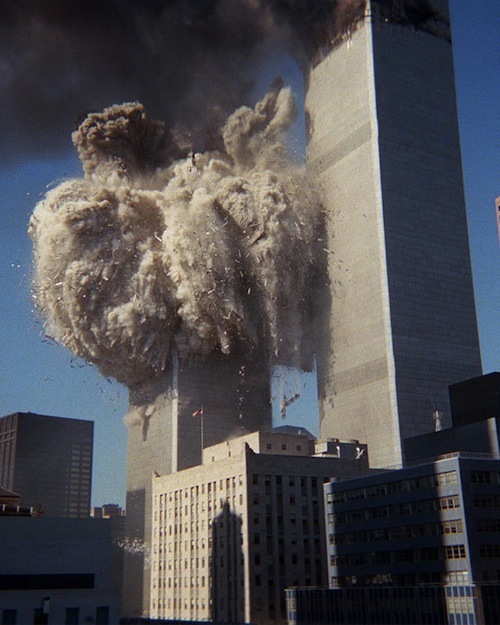 The cement hadn’t yet hardened completely and couldn’t bear the weight of the 24th floor. The failure of these columns put an increased amount of pressure on the rest of the columns on the 23rd floor until the entire floor buckled and slammed down on the floor below. The building had not been engineered to withstand such a huge increased load, and the tremendous weight proved catastrophic. Each floor gradually succumbed and plummeted onto the story below in a devastating ripple effect. Fourteen construction workers died and 34 were injured. Michael Hill, 31, ran all the way down the stairs from the 23rd floor when he saw cracks appear in the ceiling. He made it to the fourth floor when he was forced to jump out of a window. He broke both his arms but survived. 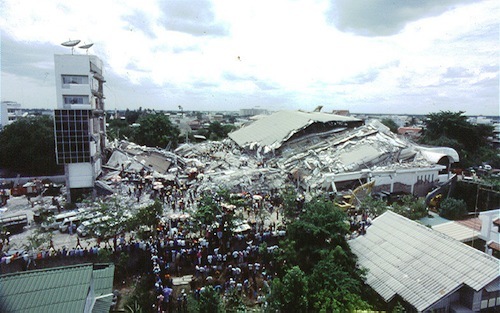 On August 13, 1993, at around 10:00 am, the once splendid six-story Royal Plaza Hotel in Nakhon Ratchasima, Thailand came crashing down in less than 10 seconds, that’s 1.6 seconds per floor! Tragically, 137 people were killed and 227 more were injured in the collapse. Rescuers dug through the rubble with jackhammers and crowbars, desperately searching for signs of life. According to rescue teams, trapped survivors had been using their cell phones to call for help. On August 15, a pregnant woman was pulled from the mangled pile of steel and debris. Devastatingly, at the time of the collapse, the hotel was being used for several meetings and seminars, including a large teacher conference and a Thai oil company meeting with more than a hundred attendees. The tragedy also claimed the life of U.S. Air Force sergeant Ramon Canda, who was in town installing telephone lines at the Korat Royal Thai Air Force Base. Police detained the owner of the Royal Plaza Hotel, the architect, and an engineer over allegations that three stories had been added to the building in 1990 without proper architectural review. Also, a huge amount of water was being stored on the roof of the hotel ahead of an expected water shortage. On June 27, 2009, Block 7, one of eleven 13-story apartment buildings making up the Lotus Riverside compound in Shanghai, toppled over, completely intact. The high-rise was still under construction, and luckily, most of the workers were able to evacuate the building when they felt it start to fall over. Unfortunately, one man wasted too many precious seconds collecting his tools. He was then forced to jump out of a window as the building began to go down. He fell to his death. Block 7 met its demise just one day after 272 feet of a nearby riverbank collapsed, proving the area was unstable and that the soil was loose. Laborers worked through the night to shore up the river, but it was no use. People in the area reported that it felt like an earthquake when the building fell. When they ran outside, they said they saw the massive structure lying flat with its foundation pillars uprooted. The development company, it turned out, had been working illegally for five years, raising huge concerns over building practices across China. Only the year before, 7,000 schools had collapsed during an earthquake in Central China. 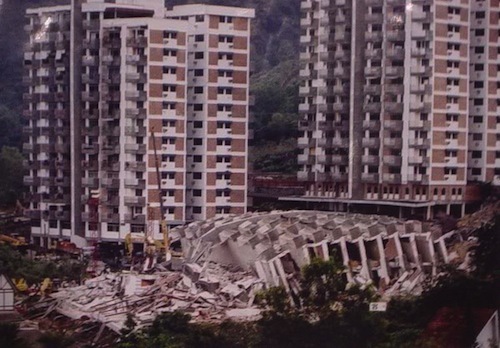 On March 15, 1986, all six stories of Hotel New World collapsed in less than 60 seconds. The building housed a hotel, a bank and a nightclub, all of which disintegrated into piles of rock and twisted metal, burying 50 people inside. It was the worst disaster Singapore had experienced since World War II, and it shocked the nation. Singapore’s newly formed Civil Defense Force launched rescue and recovery efforts immediately, and they continued for seven days. Engineers and other experts from around the world were called in to assist the delicate rescue operation. At first, they merely removed beams and other remains from the top and sides of the ruins, but not many bodies were recovered. On the second day, assisted by foreign experts who were in Singapore to build a mass transit system, rescuers began to tunnel into the rubble. Sound-detection equipment was used to help locate the 17 lucky survivors. After intensive research, investigators discovered a terrible error in the original design of the building. The structural engineer had completely left out the building’s “dead load,” in other words, the weight of the building itself, during the design process. As a result, it wasn’t strong enough to hold itself up. Tragically, Hotel New World was doomed from the beginning. 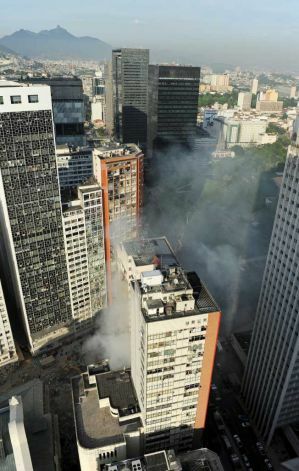 On January 26, 2012, a 20-story building in Rio de Janeiro, Brazil spontaneously collapsed. The gigantic high-rise crashed into another ten-story building and a smaller “three or four” story building, reducing all three structures to one huge pile of rubble. The impact sent an enormous wave of dust and detritus through the streets of Cinelandia square, killing at least 17 people. If the disaster had occurred just a few hours earlier, it would have resulted in mass casualties. Fortunately, the district, home to many office buildings and Brazil’s prized Municipal Theater, was pretty desolate due to the late hour of the collapse. Authorities suggested that illegal construction work had weakened the 20-story building and caused it to fragment, which triggered a chain reaction and brought down the two smaller buildings. This catastrophe has led Brazilian authorities to call for reforms and stricter building and renovation regulations, especially ahead of the 2014 World Cup. 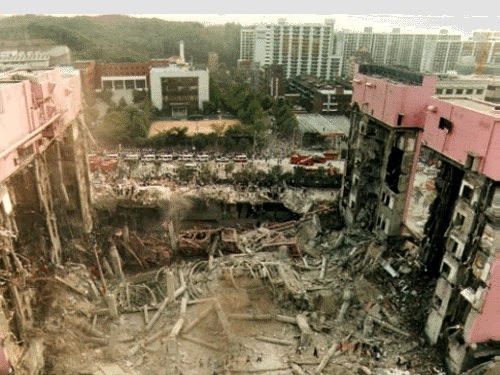 On June 29, 1995, in the space of 20 seconds, the Sampoong Department Store in Seoul, South Korea fell to the ground, killing 502 people and injuring 937. 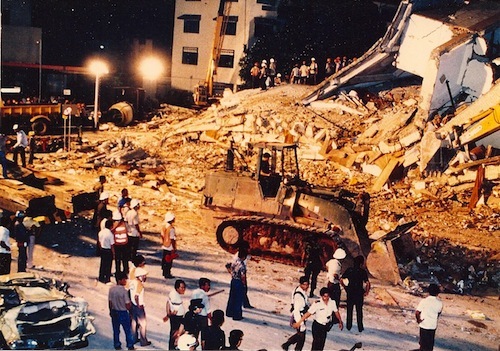 Criminal negligence, blatant disregard for ethical engineering practices, and shoddy construction led to the largest peacetime disaster in South Korean history. The problems can be traced almost exclusively to the future chairman of the building, Lee Joon. Under his insistence, the building was changed from being an office building to a department store halfway through its construction. To install the escalators, several key support columns had to be eliminated. When the contractors refused to continue building after the changes, they were fired, and Joon hired his own company. Later, Joon had a fifth floor added to the building. Despite warnings, Joon once again hired his own company. Not only was the building not meant to support a fifth story, but his extra level was made with a thick, super-heavy, heated floor. Air conditioning units that were added to the roof quadrupled the load the structure was designed to sustain. To make matters worse, the building was constructed with substandard concrete and had only half the 16 steel reinforcing bars it needed. Also, the concrete columns were thinner than necessary and were reduced even more when fire shields were installed around the escalators. In April 1995, extensive cracks were spotted, yet nothing was done. These fractures grew exponentially on the day of the disaster, but because management didn’t want to lose the day’s revenue, they refused to evacuate the building. Top executives, however, left as a precaution. 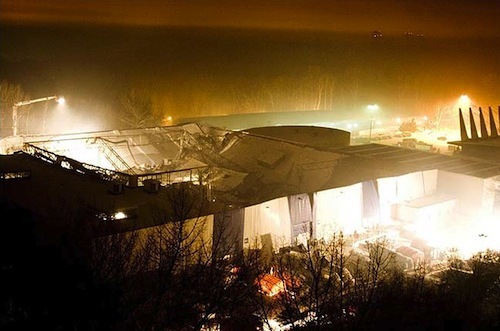 Seven minutes before the collapse, the building began to pop and crack, and employees sounded the alarm, but it was too late to avert disaster, and 1,500 people were trapped inside. Without a doubt, the most devastating building collapse in history was that of the World Trade Center, on September 11, 2001. The Twin Towers were masterfully engineered using lightweight steel, a central core, and an egg-crate design creating a “redundant” structure. In other words, if one column or support were to fail, another would take its place. What’s more, each building was made to handle 5,000 tons of lateral wind-load. The weight of the jets didn’t come close to overcoming the strength of these perimeter columns. The real problem proved to the 90,000 gallons of burning jet fuel that sent plumes of black smoke trailing into the sky over New York City. The fire itself didn’t melt the steel columns holding up the building; it only weakened them. And, though reduced to 50 percent of their previous strength due to the temperature of the inferno, the columns were still capable of holding up the building. The real issue came down to the uneven temperature of the fire, which distorted the steel on one side of skyscraper. The stress proved too much, and eventually the floors buckled and began a domino collapse, pancaking down one on top of the other. Each tower weighed 500,000 tons. 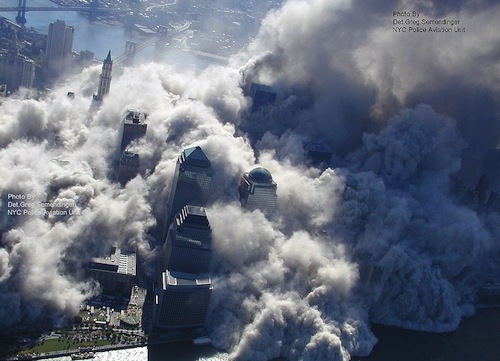 And it took just ten seconds for these immense buildings to collapse, hitting the ground at 124 mph. Despite the fact that there were no specific engineering flaws involved in the design of the Twin Towers, engineers continue to study the buildings to learn more about redundant design and progressive collapse; and most importantly, with the aim of formulating life-saving safety and evacuation procedures in the future. On January 28, 2006, in the midst of a frigid Polish winter, the Katowice Trade Hall was hosting the 56th National Exhibition of Carrier Pigeons. What the 700 people attending didn’t know was that the managers of the building had not had the snow and ice removed from the roof. Damningly, the roof had buckled under the winter snow four years earlier and been rebuilt without being properly inspected or tested. On this fateful day, the accumulation of snow overloaded the roof of the building by 100 percent, and the roof smashed down on the exhibition, trapping hundreds of people beneath its weight, and exposing them to dangerous sub-zero temperatures. Rescue teams poured in from the surrounding areas, braving the terrible weather. The building, however, was still unstable, and a second section of the roof collapsed during the rescue effort. The lacerated metal acted like a freezer, further endangering survivors. Still, rescuers couldn’t heat the air under the ruins because parts of the building were supported by nothing more than piles of snow. In the end, 65 people died and more than 170 were injured. The architects and managers of the building all faced criminal charges.